Today I am thankful for vision. Having goals, dreams, and hopes are necessary and essential. But possessing these things without vision leaves them empty and meaningless. 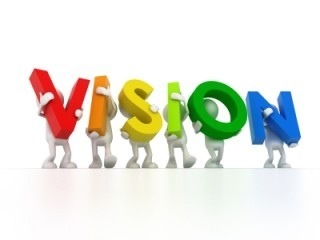 The dictionary defines “vision” as “the act or power of anticipating that which will or may come to be.” In other words having vision requires you to be able to see your goals, hopes, dreams, etc. coming to fruition. It requires a sense if direction and a sense of focus. Unfortunately, vision is something that many people lack in this day and age. They have dreams, goals, and hopes, but they do not have the fortitude to envision those things coming to pass, nor to envision themselves successfully experiencing those things. And because they do not have the fortitude to envision those dreams, goals, and hopes coming to pass, they also lack a sense of direction and motivation. Without vision a person may find temporary success, but they will likely find that long-term success evades them. If you cannot see yourself doing whatever it is that you want to do and having whatever it is that you want to have, then how can you realistically do what you need to do in order to bring it about? What will keep you motivated when the challenges of life come? What will help you to search for and find the creative solutions that you will need in order to conquer any challenges that you encounter? I am a firm believer that all things are possible with God, and I am certainly not a person who thinks that I do not need help from others in order to successfully navigate this life. I know that I cannot make it on my own, and I am glad that I do not have to try to make it on my own.